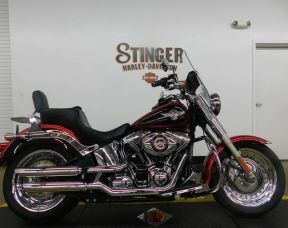 FLSTN Softail Deluxe is dripping with nostalgia, from its integrated luggage rack and seat with check side panels and a chrome grab rail to its full-length footboards and wide whitewall tires on Chrome Aluminium Profile Laced wheels. A classic tombstone tail light is perched on the rear fender. Pull-back handlebars and a low, 24.5-inch/622 mm seat height add cruising comfort. Classic paint combinations, intricate cloisonné, and sparkling chrome combine help the Softail Deluxe stand out from the crowd.